I'll admit I've not always been first in line to see British cinema. British films rarely promote action and excitement over "worthy substance" and "remarkable acting performances" and thusly are not so thrilling to watch. There have been a few exceptions to this rule however, Dog Soldiers, 28 Weeks Later and Reign of Fire are some recent examples of excellence from the United Kingdom and I'm pleased to be able to add Ironclad to this list. Ironclad's plot is exceeding simple [if you have some knowledge of history] but not all that important. 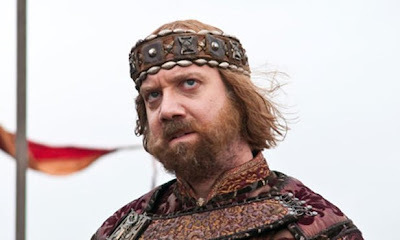 In 1215, the rebel barons of England forced the much despised King John [gloriously hammed-up by Paul Shoot 'Em Up Giamatti] to sign the Magna Carta, a noble, seminal document that upheld the rights of freedom. However before long John reneged and assembled a mercenary force with the intention of bringing the barons and therefore the country back under his control. The only obstacle in his path is the bastion of Rochester Castle from which the land and commercial paths in the region were controlled. Baron Albany [Brian Cox] a conscientious landowner who was instrumental in creating the Magna Carta assembles a ragtag group of warriors to hold out for months against King John's siege. 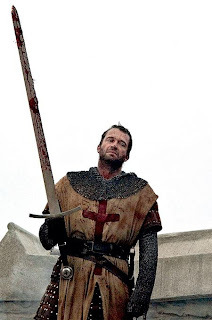 Among those defending the castle is a Templar knight named Marshall [James Soloman Kane Purefoy] who is questioning his devotion to his cause. Marshall is stilled in the art of war and is instrumental in leading the seriously outnumbered group of defenders all while trying to resist the charms of Lady Isabel [Kate Shooter Mara], wife of the lord of the castle [Derek Gladiator Jacobi]. All this however is just a frame for easily the most incredible battle scenes I've ever seen put to British celluloid. 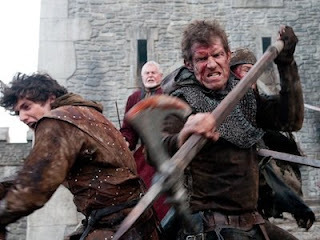 The action and violence is more close and personal then you'd imagine a castle siege to be. Despite director Johnathan English not having any noteworthy experience, he put true passion and power into directing and framing every swing of a sword and penetration of an arrow. The blood flowed in torrents of crimson and at times made even me wince as your conscious mind suddenly made sense of what appendage had been severed from the character or nameless soldier on screen. My friends, this is the only movie I've seen a man's arm hacked off at the shoulder with a hand axe and later the severed appendage is used as a weapon to bludgeon another man's skull to a pulp - Creative, Entertaining, Sublime. Final Verdict: I repeat: a man's arm hacked off at the shoulder with a hand axe and later the severed appendage is used as a weapon to bludgeon another man's skull... I'll carry that wonderful memory forever. Giamatti was on Conan the other night. They showed almost exactly the same photo you did.